A nationwide teachers’ strike on Wednesday, which unions described as “the biggest of the decade”, saw thousands of teachers stay away from the classroom, forcing hundreds of schools to close, while leaving tens of thousands of students without lessons. The action, over an almost decade-long freeze on career progression and upcoming budget reforms, appears to have compelled the government into concession. Unions have threatened an even bigger strike if imminent talks prove dissatisfactory. At the start of this week, the country’s teachers announced they would be staging a two-week partial strike. Starting Monday, teachers started not arriving for the first lesson of the day. By Tuesday, they had decided to up the ante and stage a nationwide, full day strike, which saw thousands of teachers snub their duties and tens of thousands of students miss out on a whole day’s education. Portugal’s main teachers’ union FENPROF said participation in the strike had been near wholesale, upwards of 90 percent, which in some cases meant schools had to close for the day. 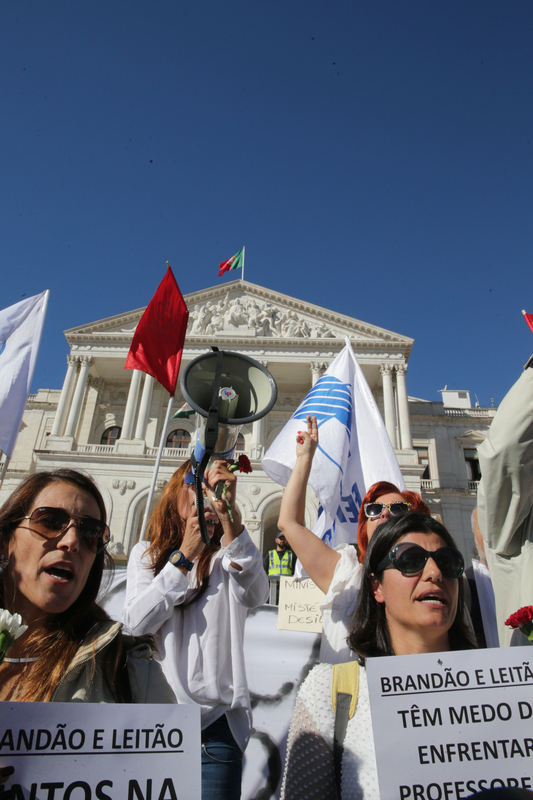 Many of the striking teachers gathered in Lisbon to stage a protest in front of parliament to further drive their message home. The action is being staged against successive freezes placed on teaching careers, spanning almost a decade, from 31 August 2005 to 31 December 2007, and again from 1 January 2011 to 31 December 2018. These freezes have seen teachers stopped from following what would otherwise have been an automatic career progression, organically climbing the ranks with time and experience, and losing out on pay rises which, accumulated, would have cost the state millions of euros. Teachers’ grievances are exacerbated by the fact that civil servants, who suffered a similar career freeze, have since had their situations regularised after the government spent 600 million on updating their professional positions. It is estimated that some 100,000 teachers are losing out on hundreds of euros on their salaries each month after the brakes were put on them climbing the echelons of progression. For example, a teacher currently stuck on the 5th tier of the education career ladder, who should by now have progressed to the 9th level, receives a monthly wage that is some €954 lower than what they could rightfully be entitled to. The government has said it would take around 650 million to refresh the teachers’ situation. Following a meeting held in parliament as the teachers protested outside, Deputy State Secretary for Education Alexandra Leitão announced on Wednesday evening that the government was willing to talk with unions about finding a way to regularise the nine year and four month career freeze; a concession it had, until then, refused to even consider due to budgetary constraints. “There will be a way to, somehow, reimburse this uncompensated time in service” the Deputy State Secretary said, in the absence of Education State Secretary Tiago Brandão Rodrigues, who was recently admitted to a Lisbon hospital, reportedly due to a stress-related illness. However, Alexandra Leitão said the adjustment would not be included in next year’s State Budget and the results of any agreements would only be felt from 2020. The Ministry of Education has suggested any rectifications would likely be done in a phased manner, and the first negotiations to this end between the government and the teachers’ unions were due to take place 24 hours after the strike, on Thursday evening. However, he said that the teacher’s wanted an ‘unfreezing’ of their careers to take effect as of next year, warning if the updating is not imminent an even bigger strike could be on the cards. “If that  is the proposal, then we will call ten times more teachers to the streets. We will not contemplate playing games”, he waged. Meanwhile Portugal’s President Marcelo Rebelo de Sousa has refused to comment on this week’s teachers’ strike, saying only that strikes are a “natural phenomenon”, declining to comment further so as not to interfere in the 2018 State Budget. Surely, if teachers were allowed to teach in a school where they live, it would avoid a lot of the expense of travel and also avoid the expense of renting in the area that they have to teach. This may go some way to avoiding an all out strike. I fully support the teachers in their work and in their efforts to secure fair treatment of all public servants. sorry I can not speak or read portuguese.